Although this film was actually quite entertaining to watch, I was originally really put off by the cover of the DVD. 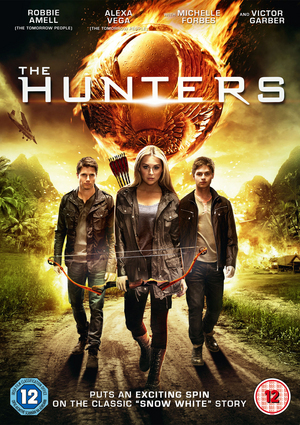 The symbol on the front (and photo-shopped bow) made it look like a ripoff of the Hunger Games. Since, however, it had been reduced to £3 (and the blurb was quite interesting), I decided to give it a try. I don’t think, personally, that the plot of this movie was very unique. Treasure hunters are used a lot… and fairy tales have become pretty popular in culture now. I did feel that the actors made this film, though. They all did pretty good jobs and I especially liked the interactions between Paxton and Tripp. I did think the obligatory romance was a bit cliched… and kind of at the wrong moment, really. I found it interesting that the film revolved around the mirror from the story of Snow White, but I was disappointed that there wasn’t more time spent on some of the other fairytales. It was interesting to see that there were some nods to other fairytales, though, such as Cinderella and the Gorgons. I do think there could have been a bit more foreshadowing, such as with the different skills Paxton and Tripp had. And it would have been nice to see the history that Paxton and Dylan had, rather than being told about it. There were some pretty cool scenes in this and it was nice to see the characters had their own skillsets. This was a film I think could be turned into a franchise. If it was longer, it could have been really good. As it is, the plot was good, but lacking a bit… even though I did like Robbie Amell in the film and the themes of family that ran throughout.